While the scars of Mozambique's lengthy civil war are not yet fully healed, the country has become a rewarding destination for nature lovers, sun worshippers and thrill-seekers in search of adventure. Its interior is home to vast tracts of untamed wilderness, including a handful of game-filled national parks. The coast comprises hundreds of pristine beaches and jewel-like islands; while a unique blend of African and Portuguese culture inspires Mozambique's music, cuisine and architecture. Mozambique is located between South Africa and Tanzania on the east coast of Southern Africa. It shares borders with South Africa, Tanzania, Malawi, Swaziland, Zambia and Zimbabwe. With a total land mass of 303,623 square miles/ 786,380 square kilometers, Mozambique is slightly less than twice the size of California. It is a long, thin country, stretching for 1,535 miles/ 2,470 kilometers along the African coast. According to a July 2016 estimate by the CIA World Factbook, Mozambique has a population of almost 26 million people. The average life expectancy in Mozambique is just 53.3 years of age. The official language of Mozambique is Portuguese. However, there are over 40 indigenous languages and dialects - of these, Emakhuwa (or Makhuwa) is the most widely spoken. Over half of the population is Christian, with Roman Catholicism being the most popular denomination. Islam is also widely practised, with just under 18% of Mozambicans identifying as Muslim. Mozambique's currency is the Mozambican metical. Check this website for accurate exchange rates. Mozambique has a tropical climate, and remains relatively hot all year round. The rainy season coincides with the peak summer months (November to March). This is also the hottest and most humid time of the year. Cyclones can be a problem, although the offshore island of Madagascar acts as a protective barrier for most of the Mozambique mainland. Winter (June to September) is usually warm, clear and dry. Weather-wise, the best time to visit Mozambique is during the dry season (June to September). At this time, you can expect almost uninterrupted sunshine, with hot daytime temperatures and cool nights. This is a good time for scuba diving, too, as visibility is at its best. 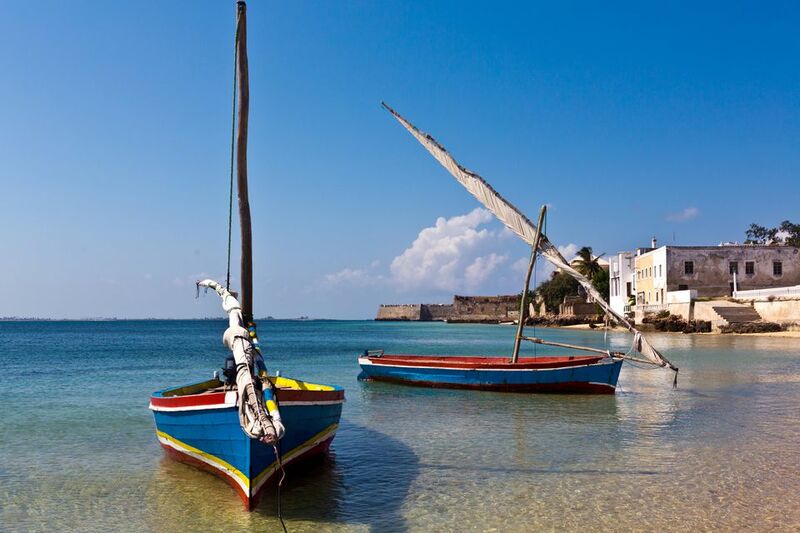 Located off the coast of northern Mozambique, this small island was once the capital of Portuguese East Africa. Today, it is protected as a UNESCO World Heritage Site in recognition of its historic (and picturesquely crumbling) colonial architecture. Its culture is a heady blend of Arabic, Swahili and European influences. A half hour drive from the southern city of Inhambane brings you to Praia do Tofo, a charismatic beach town beloved by backpackers and scuba divers. Its beautiful beaches give way to pristine coral reefs, and Tofinho Point is renowned as one of Southern Africa's best surf spots. It is one of the few places where snorkeling with whale sharks is possible all year round. Bazaruto Archipelago is located in the south, while the Quirimbas Archipelago is much further north. Both offer the perfect island getaway, with white sand beaches, crystal clear waters and abundant marine life for snorkelers, divers and deep sea fishermen. Most of Mozambique's luxury resorts are divided between these two archipelagoes. In the center of the country lies Gorongosa National Park, a conservation success story that has been slowly repopulated with wildlife after the devastation of the civil war. Now, tourists can come face-to-face with lions, elephants, hippos, crocodiles and countless other animals, all of which are thriving once more in the park's lush floodplain habitat. Most visitors from overseas will enter Mozambique via Maputo International Airport (usually on a connecting flight from Johannesburg). From there, the country's national airline, LAM, runs regular domestic flights to other parts of the country. Visitors from all countries (with the exception of a few neighboring African nations) will need a visa to enter Mozambique. These should be applied for in advance at your nearest embassy or consulate. Check the government website for a full list of visa requirements. As well as ensuring that your routine vaccines are up to date, there are several special vaccines that you will need for safe travel to Mozambique - including Hepatitis A and Typhoid. Malaria is a risk throughout the country, and prophylactics are highly recommended. Consult your doctor to find out which anti-malaria pills are the best ones for you. This CDC website offers more detailed information about vaccinations for Mozambique.